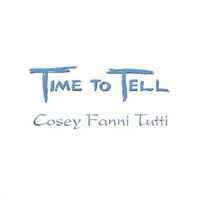 A repackaged and re-mastered release of the 1993 "Time to Tell" CD reissue, presented in a standard jewel case and without postcards but with a revised 42 page colour booklet, remastered and spacially enhanced audio tracks and an additional previously unreleased track (4) by Cosey F.T. and John Lacey. Booklet includes: press cuttings, lecture and discussion transcript, statements by Cosey on her performances, modelling and striptease work and colour photos. Also updated texts, and additional colour photos.